Google will invest $550 million in China’s second-largest e-commerce company, JD.com (NASDAQ: JD; market cap $63B) as part of a strategic partnership, the two companies announced. The partnership could help Google expand its presence in fast-growing Asian markets and battle global rivals like Amazon. The Google-Amazon battle is intensifying, especially in the area of home assistants. By partnering with JD.com, Google could further tighten its relationship with Walmart, which is an exiting investor and one of the largest shareholders of JD.com. For JD.com, the Google deal helps the Chinese company build global alliances as it seeks to counter Alibaba worldwide. Together, Google and JD.com could challenge the dominance of Amazon and Alibaba in key markets around the world, analysts said. The deal also signals JD.com’s commitment to integrating cutting-edge technologies such as artificial intelligence and robotics with its retail offerings. According to JD.com’s latest financial report, the company spent $400 million on “technology and content” in Q1 2018—a 87.2% year-on-year increase—as a result of the company’s “continual investment in top R&D talent and technology infrastructure.” JD.com has hired industry experts such as He Xiaodong, former principal researcher at Microsoft Research’s AI unit. Watch a video of JD.com’s fully-automated warehouse in Shanghaihere. Recently, Google has stepped up its involvements in China, where the majority of its services continues to be banned. It struck a patent licensing partnership with Tencent, set up an AI lab in Beijing, and invested in game streaming startup Chushou. The announcement of the partnership came on June 18 (“618”), JD.com’s annual shopping festival equivalent of Alibaba’s “singles day” (November 11). 618 was initiated by JD.com in 2010 to celebrate the company’s founding on June 18. For this year’s 618, JD.com reported revenue of nearly 160 billion yuan ($24.9 billion), a 37% increase from last year. In comparison, Alibaba’s Singles Day in 2017 raked in $25.3 billion. Note: Chushou is a GGV portfolio company. GGV was an early investor in Alibaba in 2003. VIPKID, a startup that connects Chinese students with English teachers outside of China, has raised $500 million in a series D+ round that values it at over $3 billion. The funding was the world’s largest round ever secured in the online education sector. Investors in the round include Coatue Management, Tencent, Sequoia Capital, and Yunfeng Capital. Founded in 2013, VIPKID provides one-to-one online English classes to Chinese children aged 4 to 12. All teachers are native speakers based outside of China. Last August, the company launched a new product, Lingo Bus, which provides Chinese lessons to children outside of China. The company has raised a total of $700 million, with over 300,000 paying students and 40,000 English teachers outside of China on its platform. China’s online education market is currently estimated to be worth RMB 300 billion ($46 billion). Hans Tung, managing partner at GGV Capital, discussed the impact of the current trade wars on the technology sector on CNBC. Watch here. 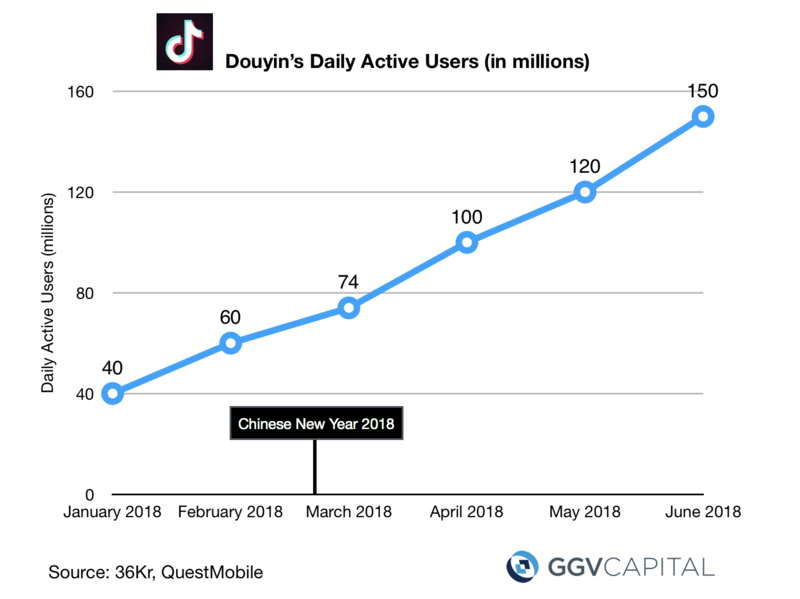 Douyin (Tik Tok), the short video app made by the $30-billion Chinese media startup ByteDance, reached 150 million daily active users in less than two years and was the most-downloaded iOS app in the world in Q1 2018. How did it do this, and what can Western companies learn from it? Read our analysis here (the post also includes multiple popular Douyin videos). A buzzword that has dominated China’s tech circles these past few weeks is “Tou Teng War” (头腾大战). “Tou Teng” is short for “Toutiao-Tencent” and also happens to sound like “headache” in Chinese. Indeed, ByteDance has created plenty of headache for Tencent (see our article above on the rise of Douyin), and the two companies are literally going to war by suing each other in court. In an insightful article that went viral on WeChat, the commentator Qu Kai wrote that Douyin (Tik Tok) will post a real threat to Tencent if it becomes a more social product and evolve into a real community. He notes that communication and community are two different concepts. Communication is about consuming content as a result of your relationships with people; community is about forming relationships with people because you consumed their content. Tencent—which has WeChat and QQ—now owns communication, but ByteDance has the potential to own community. 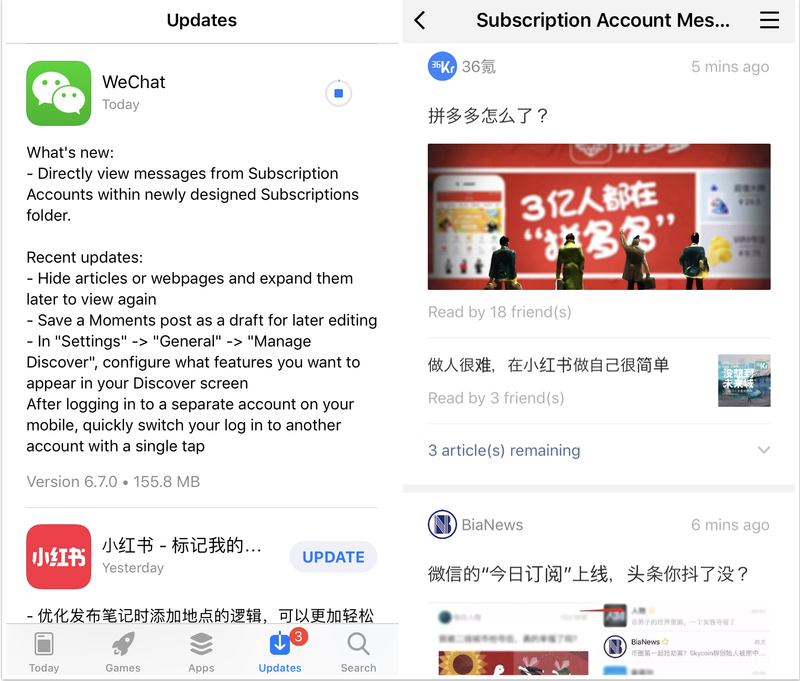 WeChat launched a major update of its app and redesigned its Subscription Accounts feature, which changed from a list of subscriptions to a feed of articles—similar to Facebook’s News Feed or Toutiao’s app. Users will also be able to see how many of their WeChat friends have read each article. The update has sent shock waves across China’s media and content community, as the 25 million WeChat Subscription Accounts have become the primary source of news for many Chinese smartphone users. One potential impact is that long-tail content creators will be able to win more traffic from the largest accounts which have largely dominated the vast majority of readership. Readers will also be more choosy about what to read and what to ignore, and content creators will need to make the most of the title and banner for each article to catch user’s attention. The update is currently available on iOS and will be coming soon for Android. Thank you for coming out to our 996 Beijing Meetup! This week, we held the first meetup for the 996 Community in Beijing. Our followers met like-minded people and discussed issues related to tech in China with Hans and Zara. Stay tuned for future meetups in other cities across US and China! Details will be announced in the 996 WeChat groups and Slack Channel. 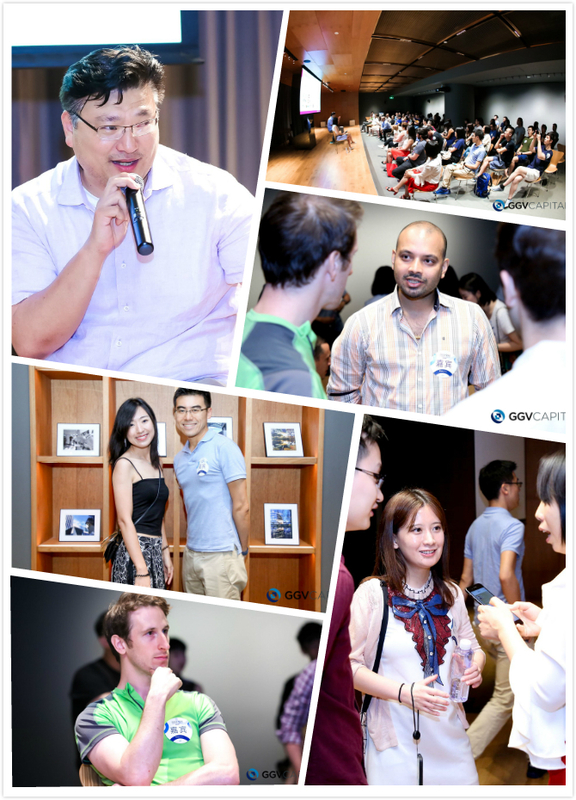 To join the community, visit996.ggvc.com/community.